Rimmy E. Tomy’s research interests include financial reporting, bank accounting, regulation, and auditing. 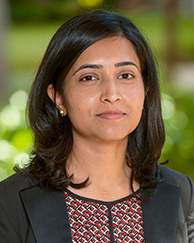 Her research focuses on the impact of regulatory intervention on firms' financial reporting and real activities, and the role of external monitors such as auditors and regulators in corporate oversight and governance. Professor Tomy earned her Ph.D. in Accounting from the Stanford Graduate School of Business. She holds an MS in Accounting from the University of Colorado at Boulder, a post graduate diploma in Finance and Accounting from Xavier Institute of Management, and a BS from St. Stephen’s College, University of Delhi. Outside of academia, Professor Tomy has previous corporate experience working at Ernst & Young LLP and McKinsey & Company. In a competitive market, a producer who experiences an increase in input prices cannot pass-through one-hundred percent of that increase to consumers. In the presence of market frictions, what effect does the internalization of an increase in input price have on firm investment? Using a novel setting, this paper finds that firms facing a shock to internal capital because of an increase in input prices do not uniformly cut back on all types of investment, but allocate capital away from investments with uncertain returns. I use the setting of the 1999 Taiwan earthquake, which disrupted the global semiconductor supply chain and increased production costs for a subset of original equipment manufacturers (OEMs) in the US high-technology industry, causing a drain on internal capital. I find that firms negatively impacted by the shock did not cut back on capital expenditures, but reduced R&D investment. We examine whether an anticipated reduction in future repatriation taxes affects the amount of cash U.S. multinationals hold overseas. We find that the expected benefits of a repatriation tax reduction are positively associated with accelerated accumulations of global cash holdings once Congress proposed legislation. Additional tests examining domestic and foreign corporations, voluntary disclosures of foreign cash, and corporate payout behavior support our conclusion that observed increases in excess global cash are driven by changes in foreign cash. We also document that U.S. multinationals accumulating excess cash engage in complementary organizational and financial reporting activities designed to maximize expected tax benefits. This paper studies managers' use of accounting discretion to deter entry. Using state-level changes in branching regulation under the Interstate Banking and Branching Efficiency Act, I find geographically-constrained community banks increased their loan loss provisions to appear less profitable when faced with the threat of entry by competitors. Additional tests rule out alternative explanations that firm economics or regulators drove the increase. I complement my analyses with survey-based evidence. Findings from the survey confirm that banks prefer to locate in markets where incumbents have high profitability and low credit losses, and that banks use competitors' financial statements to analyze competition.